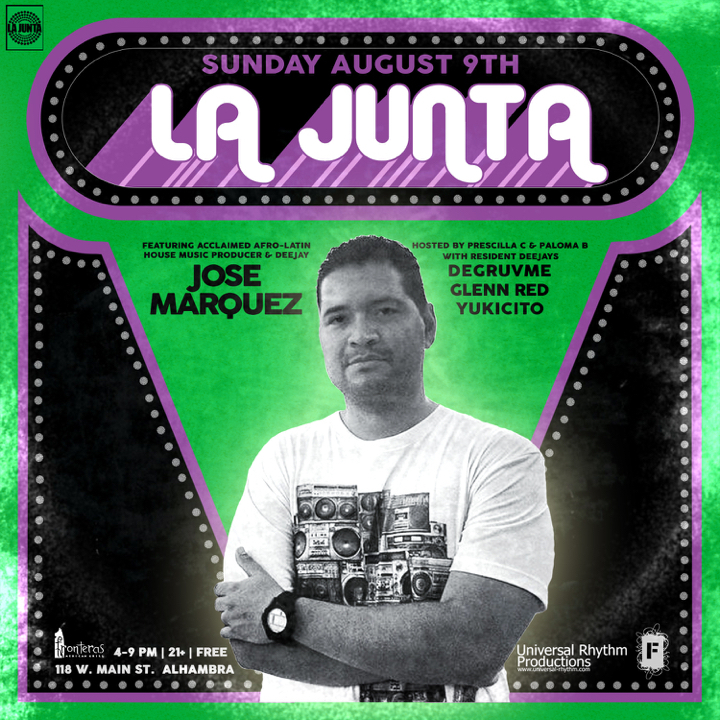 09 Aug 2015 SUNDAY: LA JUNTA x JOSE MARQUEZ (Tribe Records) | GLENN RED L.A.
We’re down to the final three events of our summer season, which also means we’re bringing out the heavy hitters! On SUNDAY AUGUST 9TH, you absolutely MUST join us for a high energy romp on the patio at Fronteras Mexican Grill Cantina, as LA’s homegrown but internationally known Afro-Latin house music producer/deejay Jose Marquez jumps in the deejay booth for what is sure to be one of hottest and brightest highlights of our summer. We cannot wait to dance together with you! Bring your dancing folk and we’ll see you there! This entry was posted in flyroll., inspiration., past gigs. and tagged african music, afro-latin, Brazilian music, Colombian music, cumbia, degruvme, Glenn Red, global rhythms, house music, Jose Marquez, La Junta, salsa, samba, Yukicito. Bookmark the permalink.